Step 1 Preheat oven to 200°C. Line a baking tray with baking paper. Step 2 Fold 1 sheet of filo in half 3 times, ending with a 15cm x 11cm rectangle. Place 1 piece of Turkish Delight lengthways onto longest edge of pastry. Fold edges in. Roll over and over to form a cigar shape. Place onto tray. Brush with butter. Repeat with remaining pastry, Turkish Delight and butter. Step 3 Bake rolls for 12 to 15 minutes or until golden. Remove from oven. Cool. Step 4 To make sugar syrup Place water, rosewater (if using) and sugar in a small saucepan. Cook, stirring, over low heat until sugar is dissolved. Bring to the boil without stirring. Reduce heat. Simmer for 4 minutes or until slightly thickened. 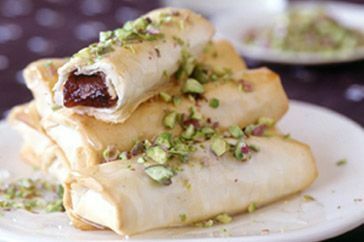 Step 5 Serve filo rolls drizzled with syrup and sprinkled with pistachios.